Become an Expert Numerologist. Pursue your passion for Numerology and allow the mystery of numbers to reveal themselves. Numerology allows practitioners to help their clients learn more about who they are, what they can become, and what they can expect in the years ahead. However, it also brings some practitioners far beyond that; to a place where knowledge stops being theory and becomes an experience. I hope you will become such a practitioner. 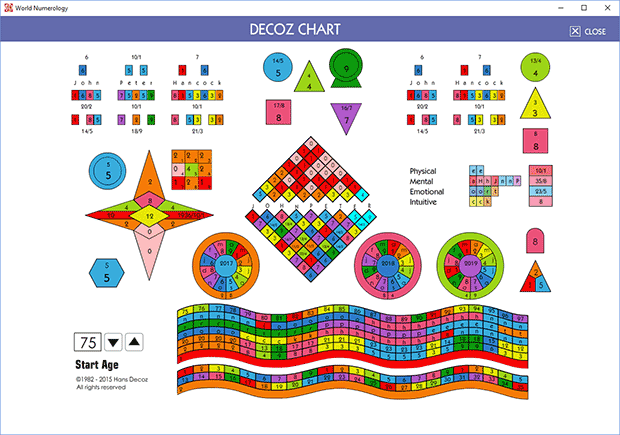 The Decoz® Chart - the most popular numerology chart used by professionals world-wide. Included free in the World Numerology Collection, the numerology chart reveals every pertinent number in your personal chart, as well as up to 100 years of cycles. The blue circle to the left of the star-shaped symbol shows the Life Path number; in this case someone with a 6 Life Path.